A new exhibition of work by Sarah J. Stanley. Monday 29th March to Saturday 22nd May. You know you want to buy ‘product A’. Actually you don’t, but you will after you have seen The Supersonic Ad Campaign’s work and seen ‘BUY’-a straight talking painting. What product A is you will know, in your heart, and you will receive supporting products to remind you of your awesome choice and make you feel happier and more fulfilled. 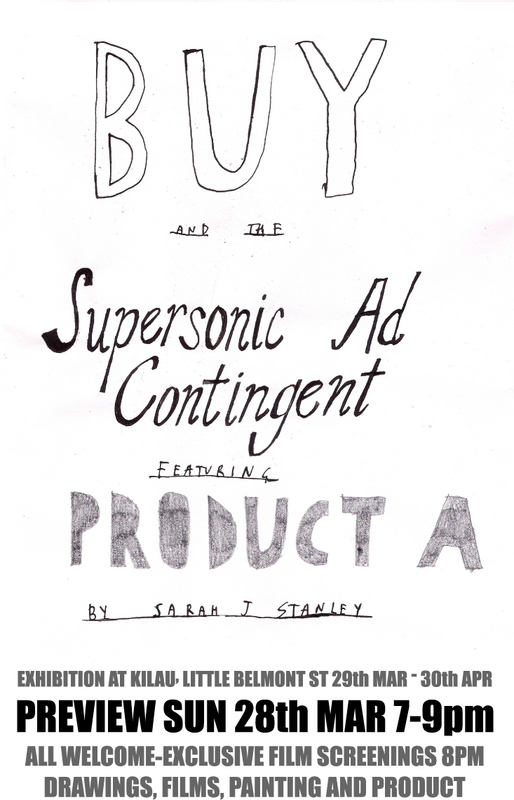 ‘BUY and the supersonic as campaign featuring product A’ is a show of film work, drawing and painting by artist Sarah J Stanley. sarah j stanley works in aberdeen as an artist and musician. graduating from art school in 2006 with a BA(hons) in fine art she has since gone on to start the art initiative project slogan, and shows work in galleries around the UK and beyond.